The Parliament – Civil Society Platform, which is a joint EU Advisory Mission (EUAM) and OSCE Project Coordinator in Ukraine (PCU) initiative designed to encourage open and inclusive dialogue among key stakeholders in the reform process in Ukraine, met the third time today to discuss the topic of community policing. Community policing is a relatively new approach in Ukraine, but has the support of the National Police of Ukraine (NPU), the Ministry of Internal Affairs (MoIA) and the international community. The topic of discussion was how community policing can be applied in Ukraine as well as the EU experience. 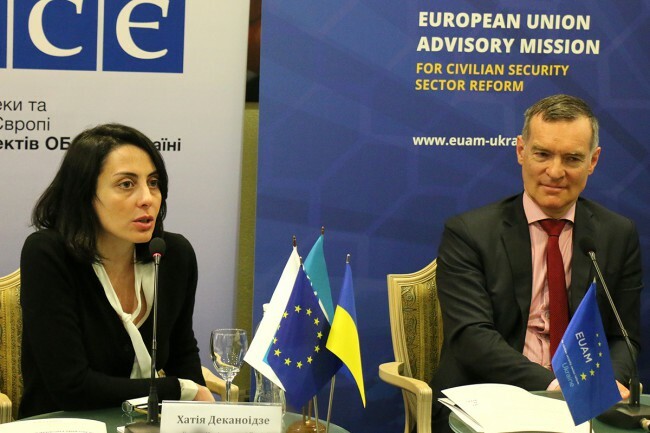 Opening remarks were given by the Chief of the NPU Khatia Dekanoidze, the OSCE PCU Ambassador Vaidotas Verba and the Deputy Head of EUAM Hugues Fantou. The Forum was attended by parliamentarians, experts, scientists, government officials, NGOs, journalists and civil society representatives from different regions of Ukraine. Community policing emphasises that police officers are themselves citizens who are members of their community. The police are paid to protect their community and as such the most effective policing model is one that strengthens the links between the police, the public, elected representatives, local authorities, social services, employees of public bodies (for example teachers, hospital workers etc. ), religious leaders and others.